Planning is a 12 month a year job, isn't it! The CASE Executive Committee just had a conference call to continue our planning as we get ready to head to San Diego for the CEC Convention and Expo, April 8-12. The Executive Committee will meet there on Tuesday, April 7 and the CASE joint membership and board of directors will meet on Wednesday, April 8, starting with a full breakfast and going until about 4:00 that day. We need as many CASE members as possible to be at that meeting where you will hear updates but even more importantly, you can voice your opinions of future plans! 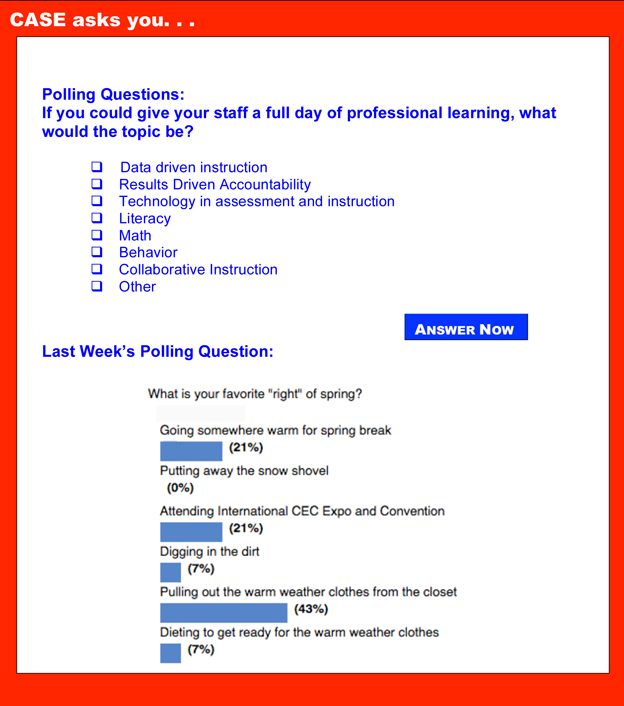 This week's poll is asking you what are your most pressing topics in professional learning for your staff. Why would we ask that question? Just like you, we have to plan year around, too! Our Fall conference (October 29-31) call for proposals will be coming up in the next few weeks but we are already working on next year's Winter Hybrid and our other meetings in 2016 and beyond! CASE wants to be able to assist you as you meet your own professional learning needs and as you plan to meet the needs of your staff, parents, and community! Some of the driving momentum for the Hybrid is to provide you an affordable option to provide that day long learning opportunity. Could you put on a full day of professional learning for less than $400, much less two full days? So, wouldn't it make sense to use the CASE Hybrid and be a virtual site? A few weeks ago we asked the question why you didn't sign up to be a virtual site. I was a bit surprised that the number one reason was cost. Even for an individual registration, $350 is not out of line for a national conference and in fact is low. But for a 2 day conference that you could invite as many people as you wanted to attend, that doesn't seem unreasonable at all. We would love to hear from you either via email or Facebook, what you think would be a reasonable cost for such a site license and remember for just $25 more, you could also receive a DVD to use as often as you wanted for as long as you wanted. The Hybrid is not a money maker for CASE and our long range goal is not that it would make us money but that it would break even. We do the Hybrid as a service to our many members who have professional learning needs but cannot afford or are not allowed to send staff to state and national conferences. What ideas do you have to help CASE better meet your professional learning needs? We want to be of service to our members and to the field—help us help you! We need you as our "planning partners!" Thank you so much for those of you who participated in our election for CASE Secretary! We also want to thank both of our candidates, Julie Bost (NC) and Laural Jackson (AK), who put themselves out there for consideration! We will be announcing the 2015-18 CASE Secretary at the CASE Membership/BOD meeting in San Diego, April 8. While it was not a general election, our Board of Directors also just completed a vote for their representative on the Executive Committee, the Unit Representative. The results of that election will also be announced at the meeting in San Diego. Special thanks to all who voted in that election and to the two candidates, Emilie Maule (IA) and Tracey Shriver (IN)! Last Week's Poll was on what is your favorite rite of spring. Isn't it great to at least dream of spring! The first place answer was to pull out the warm weather clothes from the closet at 43%. Second place was a tie at 21% between attending international CEC Expo and Convention and going somewhere warm. Of course this year, since CEC is in San Diego, you could go to the Convention AND go somewhere warm! There was another tie at 7% between digging in the dirt and dieting to get ready for the warm weather clothes! While I know many of you are still covered with snow and ice, there is at least a hint of spring in the air! I have to admit I am currently on "spring break" as I write this article and am in the sun feeling warm ocean breezes. But, as you can see, just as many of you do, I am doing some work, though not as much as I would if back in the office. I do have to say, the scenery is much better! Wishing you all better weather, soon! Recently, the Friends of the Institute of Education Sciences urged the Congress to build upon the President's request of $675.8 million and restore, as a bare minimum, $11.2 million to Regional Education Laboratories and $16.6 million to the National Center for Special Education Research, matching the 2008 funding level. They also encouraged the Congress to provide $703.6 million for the education sciences in the FY 2016 Labor, Health & Human Services, Education, & Related Agencies appropriations bill. The Council for Exceptional Children is a member of the Friends of IES. Recently, the National Center for Education Research and the National Center for Special Education Research released documentation on two Technical work group meetings in 2014 to discuss critical research needs and ways to strengthen IES research and training programs. On Monday, March 2, 2015, the Federal Register published a list of correspondence from the U.S. Department of Education to individuals during the previous quarter. Section 607 of the Individuals with Disabilities Education Act amendments of 1997 requires that the Secretary of Education, on a quarterly basis, publish this list. This is correspondence from the Department of Education received by individuals during the previous quarter and describes the interpretations of IDEA or the regulations that implement IDEA. Teachers have always been concerned with students' low work production and work avoidance. Today, with standardized tests looming in our academically-pressured classroom environments, work avoidance is a chronic and growing problem. This behavior can become entrenched in elementary school and exacerbate through the grades as academic demands rise. Students with anxiety may be particularly at risk for avoidant behavior. In this era where low student performance has dire consequences, like reduced funding and state penalties, teachers need a new approach to steering students toward achievement. This is the canary in the coal mine. Several big states have seen alarming drops in enrollment at teacher training programs. The numbers are grim among some of the nation's largest producers of new teachers: In California, enrollment is down 53 percent over the past five years. It's down sharply in New York and Texas as well. Helicopter parents and teachers, stand down. Kids of all ages need time to learn through play in school. In classrooms across the country, the countdown to summer vacation has begun. The winter doldrums have always taken a toll, but in the era of test-dominated schooling and the controversial Common Core, it seems increasingly that it's not until summer that teenagers have any prospect for having fun any more. With Congress now attempting to rewrite the No Child Left Behind law (the current version of the 1965 Elementary and Secondary School Act), it's a good time to look at what NCLB accomplished and did not accomplish. Here's one attempt to answer that question. Neuropsychologist David Rose spent years helping kids with learning disabilities participate in school by creating digital textbooks with pop-up graphics, text-to-speech, flexible fonts and other customizable features to fit individual needs. The books were so engaging that traditional books started to look relatively drab by comparison, says Rose, co-founder and chief education officer of CAST (Center for Applied Technology) outside Boston. CAST didn't just focus on textbooks. The crew at CAST felt that traditional lesson plans built around print were leaving too many kids out, frustrating some students while boring others. Neuropsychologist David Rose spent years helping kids with learning disabilities participate in school by creating digital textbooks with pop-up graphics, text to speech, flexible fonts and other customizable features to fit individual needs. The books were so engaging "that traditional books started to look relatively disabled by comparison," says Rose, co-founder and chief education officer of the Center for Applied Special Technology outside Boston. Can a robot teach children with learning disabilities and help improve their performance? The answer is yes — however, the robot isn't the teacher, but the student. The project, called CoWriter, is based on a simple principle: learning to write takes time and often feelings of mortification in class can undermine self-esteem and the progress of students with special needs. The students themselves are teaching, and they are learning as they help their robot student to learn. The market for mobile computing devices in K-12 worldwide has grown by 18 percent, according to new analysis by Futuresource Consulting. That equates to 5.7 million devices being shipped in the fourth quarter of 2014. But that growth pales in comparison to numbers in the United States, where the market grew by 40.5 percent in 2014, driven, according to the research firm, by Common Core and the broad adoption of online assessments.